The Walking Dead season 6, episode 11 - "Knots Untie", takes the series into uncharted territory. 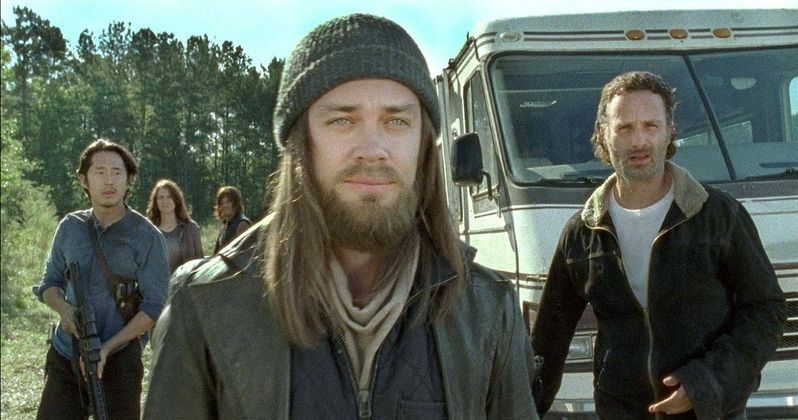 After last week's cleanup of the zombie onslaught, Rick (Andrew Lincoln) and Michonne's (Danai Gurira) coital bliss was interrupted by the crafty Jesus (Tom Payne). He shed his restraints, sized up the group's situation, and makes a pitch to the Alexandrians. He is a scout for the Hilltop Colony, a day away from their location. Jesus promises trade with multiple colonies if the group is willing to take him back. The opportunity is too great to resist. Rick, Michonne, Glenn (Steven Yuen), Maggie (Lauren Cohan), Abraham (Michael Cudlitz), and Daryl (Norman Reedus) stock the RV with supplies, then drive Jesus to the Hilltop colony. The subplot for this episode begins in the prelude with Sasha (Sonequa Martin-Green) and Abraham completing their security rounds. Abraham is stunned when Sasha explains she'll no longer be his partner, that Eugene (Josh McDermitt) will take her place. Their burgeoning romance screeching to a halt. That night, after a passionate tryst, Rosita (Christian Serratos) gives Abraham a necklace as a token of their love, but he can only think of Sasha. Their love triangle begins to brew, as Rick and Michonne's relationship is outed to the town. En route to the Hilltop colony, the RV comes across a recent car accident in the road. Jesus recognizes the vehicle and its burnt to a crisp occupants. The team searches the area and rescues the remaining Hilltop scouts. As luck would have it, a former obstetrician - Harlan Carson, is amongst them. He offers to take care of the pregnant Maggie, as a favor for the group's help. The best line of the episode comes from Abraham during the ride. He asks Glenn, "When you were pouring the bisquick, did you mean to make pancakes?" Abraham is shocked anyone would have a child on purpose. The group reaches the Hilltop colony and is surprised by their sustainability. They have animals, crops, and medical supplies. Just when the Alexandrians feel their prayers have been answered, the Hilltop Colony's leader, Gregory (Xander Berkeley), shuts them down. Smug, arrogant, and condescending, he refuses to deal with Maggie. While they have no ammo or guns, he was updated by Jesus as to the dwindling supplies in Alexandria. Gregory isn't desperate and unwilling to deal without concessions. The aftermath of the meeting changes the situation dramatically. A returning group from the colony demands to see Gregory. Their tribute to Negan (Jeffrey Dean Morgan) was not sufficient. He killed several of them, kidnapped another, and demanded a penance for their transgression. Gregory is stabbed in the stomach by Ethan, one of the returning colonists. Ethan is then stabbed in the jugular and killed by Rick. Abraham is almost choked to death during the melee. Daryl breaks Abraham's attacker's arm. As he lies on the ground recovering, Sasha voice is head by Abraham. He gets up, leaving Rosita's necklace broken on the ground. Rick demands that Jesus tell them about Negan. He recounts that Negan's group, The Saviors, had been taking half of their supplies since the beginning. They pay up or die, with Negan killing one of their colonists as an example. Daryl chastises them for paying the ransom. He and Rick float an alternative idea. They will get rid of Negan's threat, if the Hilltop Colonists share their supplies. Maggie has a second meeting with the injured Gregory. His position of strength has been flipped. She demands half of everything they have, up front, to deal with Negan. The Alexandrians load up the RV with the Hilltop bounty. Michonne and Maggie are convinced they will pay a price to face Negan. Rick sees no alternative if Alexandria is to survive. Glenn and Maggie get an ultrasound before leaving. As they drive back to Alexandria fully restocked, the group passes around the ultrasound picture. Abraham seems to have a different take on children when he looks at the fetus. Jesus and another colonist accompany them on the trip back. They will provide intelligence for the upcoming move against Negan. Knots Untie is a vast territorial expansion by the group. Up until this point, they had always played defense against marauders. From Hershel's farm, to the prison, to Alexandria, they were always on the receiving end of threats. Now that Negan has been identified, Rick and Daryl's confidence that they can neutralize him smacks of hubris. Overconfidence against an unknown adversary almost always leads to disaster. Knots Untie is further laying the groundwork to an epic confrontation, where it's unlikely the Alexandrians will come out unscathed. Abraham's romantic entanglements are also foreboding. Sasha seems to be the clear winner of his near death epiphany. It will be interesting to see how Abraham's choice plays out. The same goes for Rick and Michonne. The power couple is now front and center as leaders. But Rick's lovers always get the worst of it. I have a feeling Michonne better have eyes in the back of her head for the rest of the season.